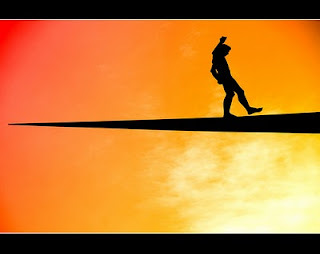 Walking a tightrope without a net maybe good entertainment, but it's hardly what project teams enjoy the most. When the deadline comes and your team is late, you know why that is. No matter how well you plan (and you must) there will always be a volcano or a flood or simpler things like changing requirements or power-outages that will delay the project. Delays are inevitable, we plan to get rid of the obvious ones, we do creative risk management to get rid of the less obvious ones, but ultimately it is impossible to avoid problems! It is smarter to be ready to deal with problems when they do happen. They did recognise that some failures were inevitable, so they focused on speedy detection and fast recovery. In other words they adopted a strategy of resilience rather than one of robustness. There's no reason why you should use only one of these strategies in your projects, in fact they are complementary. Investing in planning is about implementing a "robust" strategy. Investing in adaptation mechanisms (like iterations, re-planning, demo with retrospectives, etc.) is about implementing a "resilient" strategy. It is insane to think that a single-minded focus on "resilience" is a good idea, but so is a single-minded focus on "robustness"! Why do so many projects prefer either over the other?